If you love listening to music or watching movies, you may have noticed that some speakers or sound systems sound differently and wondered why. Well, the difference is due to different sound systems. The most common sound systems include monophonic, stereophonic and surround sound. These sound systems are different in many ways including how they work, their advantages and limitations. Read on through this article for more details on the basic differences among monophonic, stereophonic and surround sound. Monophonic, or mono sound, is a sound system where all audio signals are mixed and routed together through one audio channel for playback. The term “mono” comes from the fact that the sound format uses a single audio channel. For example, if you’re listening to mono audio through headphones, you’ll notice that whatever you’re hearing in the right ear bud is exactly what you’re hearing on the left ear bud. This is because the headphones are playing back a single channel audio file and similar sound is channeled into both ear buds. Everything will sound like it is being dispersed through both ear buds. Monophonic systems can have multiple speakers that are separated widely. A monophonic signal contains no arrival time and level information that would simulate or replicate directional cues. The most common types of monophonic sound include mono split clusters systems, distributed speaker systems and single channel center clusters. Mono systems can also be full-fidelity and full-bandwidth and can reinforce music and voice effectively. Monophonic sound is mostly used in AM radio stations, public address systems, mobile and telephone communication, radio talk shows and hearing aids. Although sound systems such as stereophonic and surround sound are more widely used today, there’re some distinct advantages of monophonic sound. The most notable advantage of mono sound is that everyone hears the same sound signal especially where the sound system is poorly designed. All listeners hear the same sound level. This makes well-designed monophonic systems suitable for speech reinforcement since they offer excellent speech intelligibility. As such, mono sound is a more preferred for public speeches than stereophonic and surround sound. Also, if you love listening to older music recordings, it is best investing in a mono version of the music since artists in the early days focused on mono mixes. Monophonic sound is also less expensive for reproduction and recording than stereophonic and surround sound. It is also easy to record using monophonic sound for it requires very basic equipment. One of the main limitations of mono sound is that it lacks sound perspective. It’s not possible to know whether or not a certain sound has been recorded from a distance. Also, films that use mono sound don’t offer much impact like the films recorded using stereophonic and surround sound. Stereophonic sound, also known as stereo, is usually created by two independent speakers or audio channels. Reproduced signals have a specific phase and level relationship to each other such that when the sound is played through a reproduction system, there’s an image of the original source of the sound. Hence, stereophonic sound has a sense of direction since the sound can be clearly heard from different directions. Sound reproduction in stereo creates an illusions of audible signals from multiple directions. In stereo, audible signals are usually routed through at least two channels to stimulate direction or depth perception like in real world. Stereophonic sound is mostly used in movies, music players, FM radio stations, and television. The main advantage of stereophonic sound is that it provides sound perspective. It gives an idea of the direction from which a sound signal is coming from or how the sound has been recorded. Stereo offers better experience when listening to films or songs. It also allows for multi-track recordings. Stereo files use at least two audio channels, such that the file sizes are larger. Thus, stereo files take more storage space and require more bandwidth to transfer. 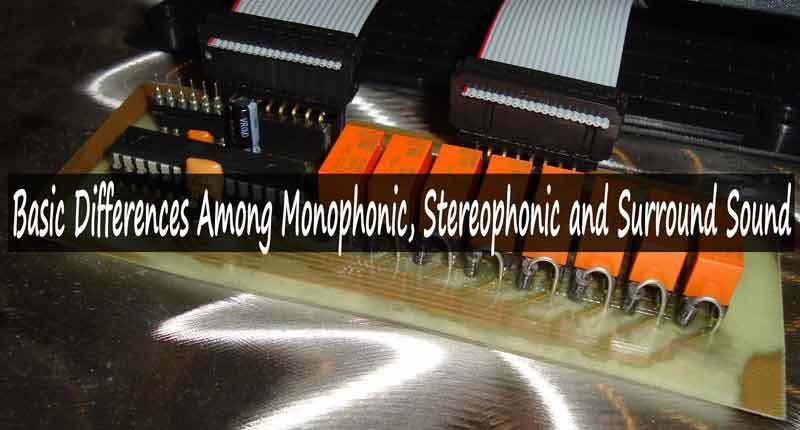 Stereophonic is also more expensive to record and reproduce than mono files. It’s also harder to edit stereo files than mono files. It also requires technical skills and knowledge to record using stereo. The equipment used in stereo are also more complex than those used in mono sound. Surround sound, also known as multi-channel sound, is usually created by four to seven independent speakers or audio channels placed behind or in front of a listener such that the listener is surrounded in sound. As such, surround sound is usually seen as a playback experience and mixing process. For instance, a sound engineer in a studio can take multiple monophonic and stereophonic audio sounds and mix them to create surround sound. The surround mix created can be played back through surround speaker systems. Surround sound can be either 5.1, 6.1 or 7.1 channel sound. For instance, 5.1 channel sound is surround sound involving 5 speakers and 1 sub-woofer. The 5.1 surround sound option is mainly used for music and movies, whereby the 5 speakers function as sound channels and the sub-woofer is used for bass in music and special movie effects. The 6.1 channel is an enhancement of 5.1 and the 7.1 channel surround sound is a further enhancement of 6.1 channel sound. Surround sound is mostly used in home theaters and cinemas for enhanced movie and gaming experience. Surround sound makes home entertainment more enjoyable and exciting. For instance, watching sports using a surround sound home theater system would give you true sounds of the arena or stadium. Surround sound offers richer tone, bass and treble. It’s also easier to adjust tone, treble and bass to your liking when using surround sound. Surround sound is not ideal for most music recordings. Most songs are usually recorded for stereophonic sound, such that extra surround sound does not enhance the music like in other speakers. Setting up a surround sound system is also more expensive than monophonic and stereophonic sound systems since it requires more number of speakers and channels. Upon reading through this article, it’s clear that monophonic, stereophonic and surround sound have their own differences. Each type of sound has its own set of advantages and an equal measure of limitations. The type of sound system you would choose would thereby depend on the kind of application needed. For instance, if you want to enjoy music recordings from the early days or make a speech in a hall, a monophonic sound system would be the best. In case you want to enjoy listening to an FM radio station, then a stereophonic sound system would be the best choice. On the same note, a surround sound system would give you the best movie or gaming experience.